A front-loading washing machine uses less water than conventional top-load washing machines. Top-loading washers are designed to fill with water that's combined with detergent to create lots of suds; suds and soap clean clothes and then the machine spins the clothes to get out the dirty water. Conversely, a front-loading machine washes clothing without the need for a lot of soap and suds. It uses mostly water and steam with a modest amount of soap to deep-clean clothes and then spins at a higher rate of speed to remove excess water from laundry items. Girvin Coin Laundry's recommended detergent volume for a front-loading machine is half the volume you would use for a top-loading washing machine. Front-loading washing machine manufacturers usually recommend using only high efficient (HE) detergent in their machines. 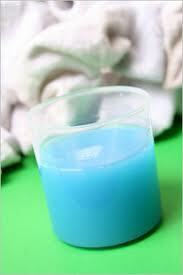 The specific detergent amount depends on the load size, laundry soil condition and your water type. Measure the detergent according to the product manufacturer's instructions for load size. Smaller loads require less detergent than larger ones. For example, a half capful of liquid detergent or less is usually fine for smaller loads whereas a larger load often requires almost a full cap of liquid detergent. In certain cases, you might need to make minor adjustments to recommended measurements. In general, the dirtier the wash load, the more detergent you need.